Please join the District Equity and Access Leadership Team (DEALT) for a Community Health and Wellness Fair at BHS on Tuesday, April 16th from 5-8 pm. All are welcome! 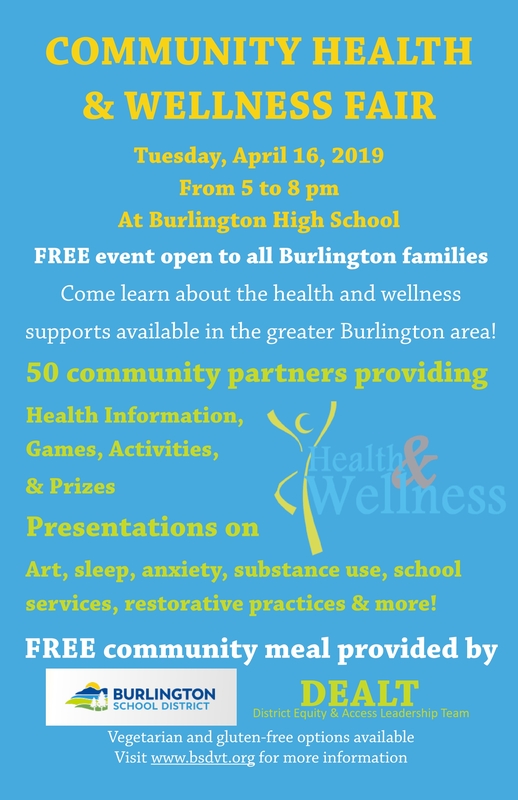 Nearly 50 health and wellness organizations in the greater Burlington area will be in attendance with information on health topics, community resources, games, activities, and prizes. Several brief presentations will be available for those who are interested in learning more about maintaining healthy lifestyles and supporting those of family, friends, and partners. A free community meal will be provided for all attendees with vegetarian and gluten-free options available. Please join us in partnership with our community health and wellness organizations in supporting a healthy community!